The Skinny: Pleasing fluff which should please those who like fluff. However, fans of director Johnnie To's harder-edged works could find this film to be a disappointment. For those who tread the middle of the road, Turn Left Turn Right can be amusing and even entertaining. Still, it's no Needing You. Phase Two of Johnnie To and Wai Ka-Fai's Pan-Asian plan finds Cantopop star Gigi Leung and Japan/Taiwan/Hong Kong heartthrob Takeshi Kaneshiro as parallel strangers fated to miss one another on the road to love. Like Phase One of the plan (Fulltime Killer, for those who are wondering), Turn Left Turn Right features talent from all over Asia (Taiwan, Japan, Singapore, Hong Kong), and a location (Taiwan) which is not necessarily Hong Kong-bound. The inspiration for the film is a popular illustrated novel by Jimmy Liao, which has followers worldwide, and not some quickie script cooked up by Wai Ka-Fai and the Milkyway screenwriting braintrust. The goal of all this Pan-Asianess is to find financing and audiences across Asia, thus identifying all of Asia as a larger cinematic force, and not as pockets of smaller, varying talent. Their plan is smart, logical and utterly worthy; getting Asia and not just Korea/Hong Kong/Japan on the global cinema map is a good lead to future financing and possible better productions. But it goes without saying that a good movie would help too. Kaneshiro is John Liu, a struggling violinist who lives alone in a Taipei apartment far too cushy for someone of his dubious occupation. Despite being played by Takeshi Kaneshiro, John is a shy loner who has practically no friends. Instead, he's a too-kind romantic whose heart beats for a girl he's never really known. That girl was an unknown crush from some high school trip, who has magically transformed into Eve Choi (Gigi Leung), a struggling translator who also lives alone in a Taipei apartment far too cushy for someone of her dubious occupation. Eve is also a dreamy loner, who longs to translate Polish love poems instead of knocking off the latest paperback blockbuster for her publishers. She also has a longtime crush: for a boy who once helped her on some high school trip. 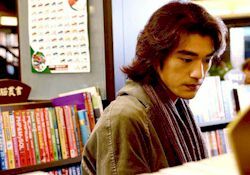 That boy magically transformed into Takeshi Kaneshiro, etc., who besides longing for her happens to live RIGHT NEXT DOOR. Yep, the two star-crossed lovers live in adjoining apartment buildings separated by one brick wall, and the only reason they never meet is because every day one turns right and the other turns left. Luckily that all changes within the first twenty minutes of the film. The two happen by the same park fountain, where they proceed to help one another when their respective paperwork (translations for Eve, sheet music for John) gets knocked into the fountain. What they discover all too soon is that each is the other's long-desired other. That quick revelation turns into a dream-date day, as the two spend their time playing with local pets, teasing local babies, and riding the carousel at the park to their hearts' content. They also, laugh, mug and generally giggle to reams of tinkly piano music. It's good that Johnnie To handles things with a light, ironic touch, as it makes things seem less saccharin than they probably really are. The performers are attractive, the music pleasing, and the art direction atmospherically sound. The preceding twenty minutes of parallel narrative devices (John experiences something, Eve experiences her version of the same event, and the two miss each other on the street) seems to float by, and the film, while not creating any real drama, looks to have some promise. The lovers seem poised to match their destinies with their desireswhat more could any movie romantic want? Sadly, IT ALL GOES TO HELL. Not the film necessarily, but the characters get booked on the express to potential lover hell. Eve and John part ways quickly after their date, managing to trade only phone numbers and not their actual names. You see, it starts to rain and their landlords turn up, and the characters want to avoid them, so they part quickly and hastily scribble their phone numbers down, but the numbers get smudged by the rain, and both catch mega-bad colds, which means THEY CANNOT CONTACT EACH OTHER. Despite the fact that they live right next door to one another, they have no idea how to find the other, and as the two continue to grow sicker, their parallel lives grow increasingly despondent and predictable. Basically, if you see one thing happen to one character, then you know the exact same thing will happen to the other. While amusing, such devices can grow old rather soon. Enter two of the most excruciatingly hateful "other people" in the romantic comedy universe: Dr. Hu (Edmund Chen) and Ruby (Terri Kwan). Ruby is a waitress/delivery girl at a local fast-food eatery, and manages to deliver the exact same meals to both John and Eve. She quickly picks up on their mutual distress over losing the other's phone number, but she doesn't do the magnanimousor even remotely humanthing by revealing the other's location. Nope, instead she decides that John is her fated one, and attempts to prevent the two from ever meeting. Ruby also spends her time acting spiteful, possessive, downright disrespectful (she moves into John's apartment and makes a mess while he's in the hospital), and generally makes young Taiwanese girls look really, really bad, even if they are cute, full-lipped and wear pigtails as well as Terri Kwan does. Kwan received a Best Supporting Actress nomination at this year's Golden Horse Awards for her performance in Turn Left Turn Right, which should trigger an inquiry into who the hell decides the nominations, and what they were smoking when they did. This isn't to say that Kwan's performance is necessarily bad, but she really doesn't add anything to a rather one-note, unlikable character. Still, Kwan is Zhang Ziyi when compared with Edmund Chen, who plays Gigi Leung's would-be suitor with the subtlety and debonair charm of a rabid pitbull. As Dr. Hu, Chen mugs, shouts, overacts, and pretty much acts his materialistic, self-involved yuppie stock character to the hilt. When Eve gets sent to the hospital (at the same time as John, natch), Hu recognizes her as a former college classmate, and then decides that SHE WILL BE HIS. He then takes her sickness as an opportunity to move into her apartment, shower in her bathroom, leave his stinky socks lying around, and even occasionally expose himself to her. Naturally, she wants little to do with him, but since she really has no friends, she puts up with his crap. Meanwhile, he forms an alliance with Ruby to keep John and Eve apart, which leads to the most obvious plot development imaginable and more frustration for an audience who would simply like to see the pretty popstars get together. After awhile, keeping John and Eve apart just seems silly and downright unbelievable. Then again, knocking Turn Left, Turn Right for its lack of realism and generally lazy storyline is somewhat unfair, because this is a fairy tale about love and fate with very little room for actual reality. John and Eve don't really exist as characters, but instead as idealized romantics who have no lives other than their noble, artistic professions (violinist and romantic poet), and debilitating need for their missing soulmate. Likewise, Ruby and Dr. Hu have very little humanity, and seem to be self-involved, spiteful characters who should get a severe beating from anyone with an ounce of humanity. The actors all excel at their types, but the fact that they don't really inhabit characters reveals the film to be nothing more than an airy confection that uses romantic concepts (fate, destiny, compatible height and beauty) as a potential hook. It may be possible for some audiences to care about John and Eve because they're played by Takeshi Kaneshiro and Gigi Leung, but is that really a good enough reason for everyone? 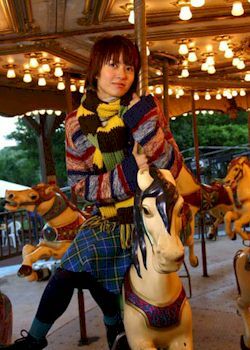  Winner - Best Song ("The Finish Line for Wooden Carousel Horse", performed by Gigi Leung Wing-Kei (Cantonese) and Stefanie Sun Yan-Zi (Mandarin).